The Dallas Cowboys have to be pretty happy with themselves the way their offseason has turned out so far. They've done an excellent job of adding some quality free agents and can now approach the 2019 NFL Draft without any glaring "needs". This pretty much allows them to approach the draft with an open mind as to how about how close to the vest they want to play things. The Cowboys now have the freedom to do whatever they want to in regards to the draft. They can choose to stand pat with their six draft picks, or they can choose to move up or down depending on how things play out. It's a freedom that could make this draft really interesting. Buccaneers receive Dallas' 2nd-round pick (58th overall), which is worth 320 points. Cowboys receive the Buccaneers 3rd-round pick (70th overall) and a 4th-round pick (107th overall), which together add up to 320 points. After making that trade, the Dallas Cowboys now have two draft picks in the third-round, three in the fourth-round, one in the fifth-round, and one seven-rounder. Continue to read below to see who I drafted for the Cowboys in this trade down scenario. Darnell Savage is one of my favorite safeties in the 2019 draft class, and someone who I believe would pair nicely next to Xavier Woods. He doesn't have the size (5'11", 200) the Dallas Cowboys typically look for at the safety position, but he definitely has the talent. He can play down in the box or deep in coverage effectively, and would give the Cowboys two interchangeable safeties. Those of you who follow my work know that I may huge fan of Mecole Hardman, so much so I nearly took him earlier over Darnell Savage. Luckily, he was still available 20 picks later. Hardman is one of the Dallas Cowboys 30 pre-draft visitors, so I'm happy to announce there is some interest there. He could play a variety of roles as a rookie and could even challenge Randall Cobb to be the starting slot WR. At worst, he would be a good "gadget" player, deep threat, and return specialist in his first year with the Cowboys and take on a much larger role in Year 2. 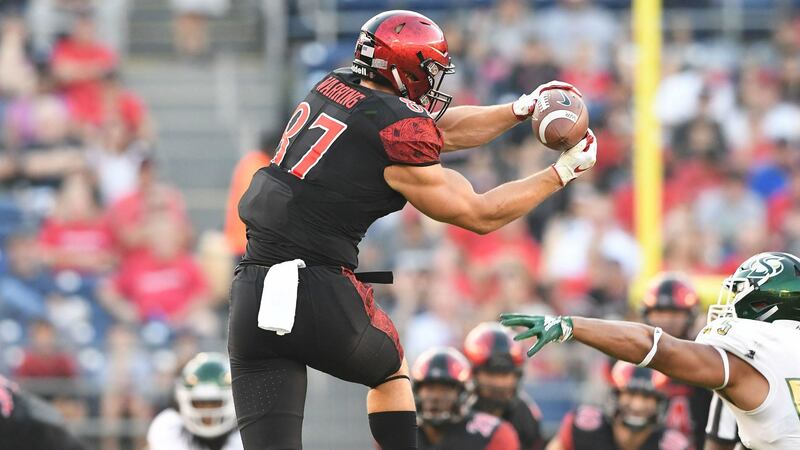 Kahale Warring isn't a name creating a lot of buzz amongst the 2019 tight end draft class, but it should be. He has all of the intangibles NFL teams look for in a starting TE, but he's a little raw still and could use a year to develop. Luckily, the Dallas Cowboys can offer him just that. He could come in and learn for a year behind Jason Witten and then take over as the TE1 in 2020. Isaiah Johnson is someone definitely on the Dallas Cowboys radar. They have met with him at the NFL Combine and were in attendance at his Pro Day. He fits the size (6'2", 208) Kris Richard looks for in his cornerbacks, but he may not be ready to start right away. He would probably provide depth as a rookie and then be asked to take over in Year 2 when Byron Jones and Anthony Brown's contracts expire in 2020. Trysten Hill is another player on the Dallas Cowboys radar. Rod Marinelli personally worked him out at Hill's Pro Day and he's expected to be one of the Cowboys 30 pre-draft visitors as well. He is a big athletic defensive tackle who would fit best as the 3-tech in a 4-3 defensive scheme like Dallas deploys. He has the talent to start right away as a rookie, but at worst would be a really good rotational piece. This is the point in the draft where teams start to look for intangibles they can develop. Shareef Miller has the necessary tools to become a starting caliber defensive end in the NFL, but right now he's pretty much just a one trick pony. He relies on his speed as both a run defender and pass rusher right now, but if he can't win with that that he's pretty much done. He needs some time to develop, which he should be able to receive with Cowboys after they just acquired Robert Quinn. There were a number of running backs still available here I had to choose from, but it ultimately came down to either Darwin Thompson or Bruce Anderson. For me, it was easy decision because Anderson is another one of my "pet cats" this year. I think he brings more to the table than Thompson as both a runner and receiver out of the backfield, but he also has special-teams value as well as a kick returner. I think he would complement Ezekiel Elliott really well. How do you feel about this Dallas Cowboys 7-round mock draft?